There's nothing quite like a full nights sleep, which I thankfully had last night :) TheBrad kindly took over standby for the night for me and looking at the emails sent round, he had a rough night. But I really could not have managed it a third night in a row! Instead I went to Yoga. That's right folks, I made it 3 times this week :) Well, that's partly because I know next week is a totally write off thanks to my upcoming birthday festival! And then I headed off to Sakura for some sushi ... yes, alone. Why does everyone gasp at that? It's a conveyor belt of sushi, it's like going to movies alone. Loulou was out for dinner with her mom and I wanted sushi. I'm such an independent girl ;) The sushi was fab and then I came home to watch some Dexter and CSI. So here's a topic I've been meaning to write about, and it's a bit of a weird one ... in fact I may be the only person who wonders about these things (if I'm not, please leave a comment to let me know I'm not alone!). Why do we say "Please"? Is it weird to say that I just don't understand the concept? I realise it is considered polite, but I'm a logical sort of girl and I just can't see the point. "Thank-you", on the other hand, I understand completely. If I ask you to do something, do I want you to do it any less if I don't say "Please"? Does it somehow change what I've asked for? Why on earth would one single word make a difference as to whether I do something for you or not? What a crazy notion. "Thank-you", as I said, I understand. It shows appreciation for what has been done ... whether it was asked for using a "Please" or not. There are so many things in life (work particular) that we do not get a choice in whether we do or not. So why would you think asking me to do it with a "Please" would make me more likely to do something I already don't want to? It's not like I can say no to working on this Project or delivering this work. Oh, and don't get me wrong, I still use "Please" occasionally ... it's been ingrained into me by societal norms, like so many other things. But it still annoys me. I think "Please" is a bit like the whole "Yawn" thing* and we should get over it. 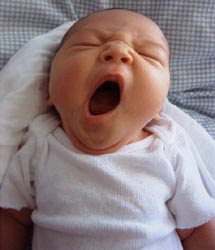 * Certain superstitions surround the act of yawning. The most common of these is the belief that it is necessary to cover one's mouth when one is yawning in order to prevent one's soul from escaping the body. Etiquette seems a mostly antiquated practice and almost unnecessary these days, who has space for it in a mere 160 char sms? But don't misunderstand, I don't mean to abolish it completely, I think there's a fair amount of improvement in the quantity people are currently using "Thank-you" ... but perhaps that's because I'm a Joburg driver and no-one round here seems to think there's any room for Thanks on the road, even if you let them in at the last possible moment because they thought they were too special to wait in the lengthy turning queue like the rest of us ... something I never do, because really, people need to learn a little forward planning and hell, if I can wait in the traffic, so can you. Unsurprisingly, I don't get it either... must be something to do with the oldies. I thought we covered our mouth when we yawned so that people didn't haven't to look into our gaping holl of a mouth? Personally I don't give a crap about the soul (mine is going to hell anyways :P) I'm more against being able to see the person next to me's tonsils! @leigh - now there's a good logical reason that even I can get behind!